Dear Folks, France is just like in the movies and the French people very hospitable but their customs are strange. I am well and enjoying it over here. "Beaucoup” love, your son. The PD printed enough letters to fill a book (which wouldn't be a bad idea) and a sample of the ones written from France can be found transcribed below, following the roster of those who died. The paper also ran letters from England and stateside training camps. Rarely did they write about their combat experiences in much detail ("I am now busy and happy doing my bit at the battle front") which is understandable, as they didn't want to worry friends and loved ones. But sometimes there are hints of the harrowing war: "We have lots of cannonading and shelling, both from our front and from the Germans, and we have gas attacks quite often. I had to wear my gas mask for four hours one day, and I have to carry it with me all the time, and also the helmet." As they were billeted in French villages near the front lines, their interactions with the villagers were frequent topics. "...It’s surprising how we can get along with these people and make them understand us. Not a one that speaks a word of English, but we talk by using a mixture of English. French, Spanish, German, hands, feet, ears and eyebrows." They were gobsmacked by the amount of wine being consumed ("the equivalent of 26 cents American money would purchase the finest bottle of Port Wine or Claret ever made") and that their pastoral country life seemed untouched by modern times ("a person here never needs an alarm clock to wake him up. There is always someone going down the street with wooden shoes and you can hear them for four blocks"). There are many other anecdotes about village life I could excerpt here, but I'd rather you scroll down and read the actual letters which are genuine and heartfelt, revealing how the old world culture and the Americans were mutually astonished that the other existed. Okay, one more - don't miss the story about the Frenchman who learned how to blow Taps on a bugle to impress his girlfriend, causing a wild scramble as the soldiers rushed back to camp. But don't presume the PD was just offering up lightweight fare about locals having a good time behind the lines. The paper also printed letters from two correspondents which contained details so raw that editors might hesitate publishing them today. One of the letter writers was Major Hilliard Comstock, an unabashed hero of this journal. He last appeared here in 1916 as Captain of Santa Rosa’s National Guard Company E when they were sent to the Mexican border to protect the United States from Pancho Villa. Company E and other units of California's National Guard were ordered into service in 1917 and became part of the regular U. S. Army. ...He described the German machine gun fire as very intense after the Americans had lost their artillery barrage. His battalion had advanced quite a bit more rapidly than those on its flanks, so that the Germans made it awfully hot from the flanks for awhile. His plattoon was badly shot up at one stage and had broken loose and run. A big shell burst near him and be found himself whimpering and crying from the shock and excitement. He was in cover in a shell hole, but realized that if he stayed there his nerve was gone, so he forced himself out into the fight again. During the fight he twice traveled back forth with information. But here was the best thing he did. His platoon had advanced right up by the side of a machine gun position. There the boche was in the act of swinging his gun to open fire on the flank of his platoon. With a lucky aim from his pistol he shot the gunner straight through the neck, killing him instantly. Comstock wraps up the story by writing that the Army would recognize Herbert's valor and give him a promotion (he was made a lieutenant) but the British commanding officer of his battalion would not recommend him for the Distinguished Service Order because "bravery is only an officer’s duty." After a few days in Paris she was dispatched to a large military hospital in Beauvais, on the Somme front. Her first letter described the grim scene as she drew nearer the battle zone: "As we passed through the various villages I got my first real glimpse of the meaning of the war. Saw many trainloads of soldiers, French, English, American and Algerian, many wounded returning from the front, and many fresh companies going towards the scene of action. We hear the booming of the distant cannons daily..."
From the hospital she wrote candidly about her patients, both those recovering from surgeries and those with shattered minds from PTSD: "[There] is a dear boy named Blossom — Karl Blossom — who seems to have fallen back on his nerves. I find him wide-awake at any hour I make rounds, so have taken to sitting beside his bed for an hour or two at a time in the wee small hours." Another: "He suffers from shell shock, and it is pitiful to see him — he is delirious half of the time — living over again those hours of the battle." Connie became inured to the sights and sounds of the nearby war, and would go outside when she heard German reconnaissance airplanes, which were sometimes involved in dogfights with French aviators. "These day air battles are exciting to watch. As a rule the machines are too high to see but we can hear their guns plainly and see the smoke from them - like small, fluffy white clouds." 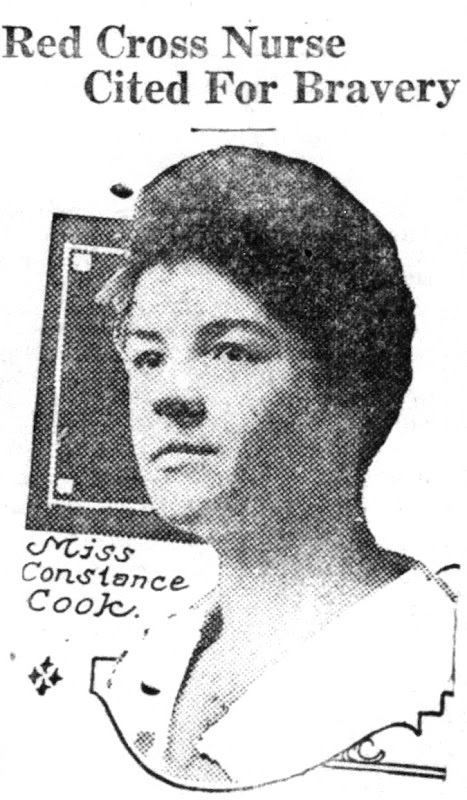 Press dispatches about the hospital bombing and later the Croix de Guerre made Constance Cooke a household name in the Bay Area, claimed both by San Francisco and Sonoma county. (Nor did it hurt that she was pretty; there were three wire service photos of her in circulation.) Julius Myron Alexander wrote a really awful poem about her which appeared in the Healdsburg Tribune June 6 and was reprinted in the PD the next day: "She came from the land where poppies blow/ From the land of Western sunset glow/ Where murmuring brook and song of bird/ So soft o’er the land all day were heard/ ’Twas there the maiden grew from her youth/ Nourished in love and God’s own truth..."
...The night of May 29 was terrible. The corridors and courtyards of our hospital were filled with wounded men, operation cases, waiting for treatment. The buildings adjoining us were struck, thirty losing their lives. I thought it was our end, but we worked on. The bombing finally became too terrible and we were forced to move our patients to Paris. Air raids were going through every night for five weeks. The brilliantly illuminated red crosses designating the hospitals were used as targets by the Germans. The people of the city slept on the hillsides to escape the foe...the valor of the American girls quickly won the hearts of the French, who at first were skeptical. Many times our nurses worked for three days and nights without sleep, caring for the wounded. The American boys were always regretful during raids that they had no means of fighting back, and declared their preference to the front lines. Asked if she fell in love with anyone over there, she replied, "yes, I fell in love, but with the whole Yankee army." I know that sounds cheesey, but I believe she actually said that; read her letters below and you'll find her tenderly describing patients as "my children." In truth, she married San Francisco attorney Robert Wisecarver in 1920. During the 1960s she was state chairman for the USO and died at age 101 in 1989. She's buried in the Oak Mound Cemetery, Healdsburg; stop by next November 11 and say thanks. "Today I received two letters from you and a Christmas card from Mr. and Mrs. C. E. Johnson. Was sure glad to get them - the first news from home for six weeks. They were postmarked December 15th, so you can see my mail travels far before it reaches me. I am anxious to know how you spent Christmas. "I received a letter from Don Campbell today. He was quite sick for awhile in Nice, but from his letter I judge he found that city a wonderful place in which to convalesce, and he stayed there until he was about O. K. He is now back with the old Section, now 586. "I am about 60 kilometers down the line with my new Section, again listening to the melodious Boche shells (most odious I assure you) and superintending the work of 33 young speed maniacs hauling sick and wounded Frenchmen under shell fire. I am responsible for about ten kilometers of the front and must see that all sick and wounded are transported from the trenches to the hospitals and evacuation posts farther back from the lines. It is quite a job and when there is much activity I am kept busy. There is a fine, eager spirit amongst the crowd, the majority being old hands at this business and well understand what is expected. They were among the very first Americans who came to the aid of France three years ago. At the Front, May 8th, 1918 — Please forgive me for waiting so long. It is because I've been “going it” as hard as ever I could for the past three weeks. All I've done since coming to is work, sleep and eat. I make it a point to go to bed early (10 p. m. until 6:45), so you see I have a lot of rest. Our food is served in plenty, but is not such well-balanced diet as we are accustomed to i. e., meat, is served In abundance, also cheese, jam, wine, lentils and "war bread” without butter. We’ve scarcely seen butter. green vegetables, milk or desserts since leaving New York, except for the four days at the hotel in Paris where we had butter once a day and also a green vegetable, and occasionally lettuce. We were quite busy for a few days after arriving in Paris, getting our papers filed and accredited, and securing certain other necessary papers. One evening five of us ventured out to a moving picture show. After sundown there isn’t much light on the streets to guide one. Very few of the street lamps are lighted and those few are made dim by means of being painted with dark paint. We paid the extravagant price of 3 francs 80 centimes (72 cents) apiece for our seats. Were surprised to see a picture produced in Los Angeles - quite American. During the evening a picture of President Wilson was flashed on the screen. We clapped loudly, and as a result became the center of attraction for a few minutes. When the main picture was about finished the curtain descended and the ushers quietly informed the people that an air raid was “on.” Everyone calmly left the theater. When we got outside we heard the awful whirring of aeroplanes and the bang! bang! bang! of the bombs, and looking down the wide drive of the German Elysees we could see the glare of an immense fire caused by the bombing. At first we thought we could walk home in time but as the bombing was continued we fled with others into a nearby “abri” (shelter in a deep basement). We were too interested to stay long so [we] stood in the doorway of the building watching the flames of the bombs. When an alien plane gets into French territory, wireless messages are signaled and a siren (“alert”) warns the people of the danger, whereupon they seek shelter in the "abris.” When the enemy has been driven away another siren sounds and bells are rung to give the signal for safety. After four days I was sent by Miss Ashe to the Grenelle Dispensary, Paris, to do the same type of work for about a week as that in which I was once engaged at the Petrero in San Francisco. Then came an emergency call for a relief nurse to replace one who was ill, so I was hurried off on the evening train, April 20th, to ---------, two hours north of Paris, and 30 miles from the front. I was accompanied by Dr. Pearson of Massachusetts, a brother-in-law of Dr. Harry B. Sherman's wife, (whose little girl I nursed when she had measles). When we were nearing this historic town the Doctor informed me that we might be bombarded, so not to be afraid. I told him I would be quite frank to admit I that I would be afraid, but that I would endeavor to conduct myself in a quiet and orderly manner, nevertheless. Expect to be transferred to a military hospital for the care of French and American soldiers tomorrow, as the refugee question in this particular district is about settled. I am glad to go, however, as now that we are “over here" we feel the American boys should be our first consideration. Please let all of the family read this, as I don't know when I'll have another chance to write. Lots and lots of love, Connie. Do write soon. My undertaking, as you call it, is only a drop in the ocean compared with this ghastly war. You know our ideas have changed by degrees since leaving the United States, and have come to the wonder why we did not start for France long ago. Everyone over here feels as one that no sacrifice can be too great in assisting to win the war for humanity and a higher type of "Kultur." I've come to believe a lot in "fellowship" since leaving the United States. My! how I crave companions all of the time. Of course, under so many precautions and in the war zone wo have almost no social life, and it is a mighty nice thing to have a few other nurses, Red Cross official and soldiers to chat with during the day’s work. Mr. Censor probably wouldn’t like me to go into much detail. I wish I could tell you many things of interest. For the past few nights I have been on night duty. I just try to do everything under the sun to "coddle" the men, because It means so much to them after their experiences at the front. The Red Cross and the Smith College Relief Unit give much comfort to the soldiers in a thousand ways, and give the nurses many things to distribute. In fact, we get just about all we ask for, i. e., cigarettes, chocolate, cocoa, canned milk, jam, tooth brushes ond powder, soap, washclothes, shaving sets, toilet paper, towels, extra pillows (you know a small pillow tucked here and there makes a world of difference. sometimes), writing material, dally papers, matches, lemons, and oranges, and even money for boys who haven't received pay for several months. Well, all of these things gladden the hearts of our “blessees,” and all of our efforts are used to do just that, aside from nursing. The other night, after distributing chocolate, various pills, rubbing the aching members of a number of patients in one ward, stuffing in a pillow here, tightening one there, etc., I found dressings over, loosening a bandage here tightening one there, etc., I found a sleepless family on my hands. So I played poker (horror of horrors!) with one of them by the light of the smoky lantern until 1:30 a. m. with the others vastly interested in the outcome of the game. We used cough lozenges for chips. Then I informed them that they just had to go to sleep, but if there was anything else they wanted before I left to say so. One sang out, "Well, if you'll just stay here and let us look at you, that's all we ask.” You see it's just the idea of someone of their own kind fussing around which "hits the spot" as it were, after trench life. So I left my children and made rounds in the three other wards. In one of them is a dear boy named Blossom — Karl Blossom — who seems to have fallen back on his nerves. I find him wide-awake at any hour I make rounds, so have taken to sitting beside his bed for an hour or two at a time in the wee small hours. Of course, I enjoy every bit of the work and am glad I finally got "onto" myself to do my bit. We have a comfortable room at the hotel and good food. So you see I'm really quite well looked after. Our unit has been scattered all over France. I never saw Dr. Lucas to speak to, as he left France for America right after our arrival. Letter From Healdsburg Man Tells of Exciting Experiences "Over There,” as Well as the More Pleasant Forms of Life. "I am now busy and happy doing my bit at the battle front. I am down in an old French wine cellar, since our hut was bombarded on the 20th of Aprll. I have been walking and standing around in my rubber boots most of the time, as it is muddy here. I serve the boys as they go and come from the trenches. I make coffee and cocoa, and they claim it is the best they have tasted since they came to France. We give it to them free. We sell at cost candy, nuts, figs and such things and have tables for reading and writing. We have services and entertainments for them and they sure appreciate it. Interesting Letter Sent Santa Rosa's Well Known Citizen by Brave Soldier Fighting the Battle of Freedom 'Over There." I received your letter and sure was glad to get it. We always want to hear from home and in my case from California where I hope to spend my days after this "cruel war" is over. I have seen a few of the places you advised me to look up...What a great people are the French. And what a history they have. I turn now to the present. I wish you could see the big dally papers, over here, compared with the dally papers of American cities, they are but toys, I know something about papers, for you know I served an apprenticeship on the Los Angeles Times. That is a great paper. Mark Twain did not overlook the barber when he visited over in Europe. His account of the barber and the barber shop is good. He gave a funny experience as the readers of Innocents Abroad will attest. I will tell you my experience. Entering the shop I was conducted to a chair — I mean a barber's chair by a highly uniformed porter. 1 thought He was a major-general. The shaving seems to be a family affair. A kid of twelve or fourteen years lathers your face and he does not skip any part, not even the eyes or mouth. Another kid rubs the lather well in, then comes Agamemnon, the barber himself, razor in hand and he does the work. You sit flat in the chair, feet hanging down to the floor at a right angle from the knees. No lounging with feet elevated and resting on a soft vervet cushion as in America. I must tell you something about the war - the censor may strike it out, but I will try it. Listen, Germany will be beaten to a frazzle inside of a year. I have talked to too many prisoners not to know what I am talking about. They were always hungry and wanted peace. You would hardly believe your eyes if you could see our boys almost fighting to get on to the front line. They want a lick at the Huns, let me tell you, and let me say to you, don't talk peace. I don't want peace until our boys nail the American flag on the door of the Hun capital and they will do it and don't you forget it. From Paul Stevens, a Sonoma county boy with the Engineers in France, The Press Democrat has received another issue of "The Spider,” a monthly paper published by the Engineers and which is full of interesting and breezy notes of the life of the soldier "over there." At the dance some were dancing American steps and others French. "But the overseas steps prevailed, for what is a French maiden to do when all pieces are ragtime, and her partner is a burly railroader intent on putting over his schedule of "Bunny Hug" and "Boston Dip?" At that everyone enjoyed it. Including the small Yvonnes and Jeans who, with the older Messieurs and Mesdames, had only come as onlookers. The whole village turned out, and the French folks outnumbered the Americans. The American idea of breakfast is something new to the French. They don't have "breakfast” in France; they have "dejeuners." But they don't have dejeuners until 11 o’clock. Until recently it was a familiar sight in most any French town to see Americans, early in the morning, roaming around desperately looking for a place to eat. Then some enterprising French restaurant keepers found out the Yankees eat as much at 7 a. m. as they do at 7 p. m. Catering to the new allles’ sun-up appetites they displayed stiffly formal cards: ” Breakfast Served." And then, " Eggs and Ham." In a village near which a portion of A Company is located, three Frenchmen went forth to serenade their lady loves not many nights ago. One had an accordeon, another a bass drum, and the third a bugle. They rendered several selections under the windows of each of the three "maisons" which they hope some day to win, while the appreciate demoiselle, in each case threw down a bouquet to her favored lover. "I was very sorry such newspaper reports got into San Francisco papers. It seems the correspondents are keen on exciting the home folks. Many instances, however, come to our notice which are certainly worthy of being known by the public. "The French are glad and proud to have the Americans in the trenches with them, and our boys are certainly doing big things at present. I am proud of them. "On the Fourth of July there were celebrations all over France to honor the Independence Day of America. You know the French are great for 'frills' and fetes. Their preparations in the various hospitals for the benefit of the American nurses and patients were really touching. Decorations were made from the wild red poppy, bachelor buttons anf marguerites. "There was quite a celebration in the town square. French and American flags were flying everywhere the eye turned. Captain J—- was a little worried that the boche might give us another raid and break up the party, and we expected an offensive at the front. But there was no raid and our boys gained more of the enemy's lines that day. "The fete of July 14th is at hand and we plan to return the cordiality of the French as far as possible. "You would smile If you could see me now with a tiny night lamp, shaded very carefully, straining my eyes to write. "I think I wrote you about being changed from my ward of American boys, after their departure, to a newly opened ward with twenty Frenchmen. As soon as they were evacuated, I was put on special day duty for one week with a pneumonia case (a boy fron Oklahoma) in a French hospital. As soon as the boy was well enough to get along with an aid, I returned to our Red Cross hospital and took back my original ward. There were only seven patients, but within a day or so there were twenty-seven. "On the 3d of July, Dr.-------, who has charge of those of us who first came to B------, took Miss Joaquim and me in his machine out to C------, a little village about six miles from the Somme front. Beyond this town a short distance, is located a French hospital for gassed cases. There are seven or eight American nurses and aids on duty there. Dr. C. and Chaplain L. had been invited to a dinner and Miss Joaquim and I had dinner with the nurses. Later we were shown through the entire hospital. It was a tent hospital, i. e. some ten or twelve long tents and two brick buildings - accommodating about three or four hundred patients. It was all extremely interesting to me after the work I had done in B, with the same sort of cases. "On July 4th, Dr. ------- obtained special permission for fifteen nurses and aids from several different villages to go to C-----, close to the front, where the 1st Engineers are stationed. The officers had planned a barbecue and had sent us earnest invitations to be present. At the work was not so heavy at the time, we were mighty glad of the opportunity to out so close to the trenches. We did not go into the trenches, but were very near to the reserve trenches. On the way out we saw many instances of the use of camouflage and also miles and miles of barbed wire defenses. “It was quiet in that particular sector so we heard only one or two cannon blasts. Just beyond Field Hospital No. ------ we came to a stretch of woods and going around to the rear of them we came upon extensive fields, where the 1st Engineers were stationed. There were hundreds of men in uniform. We arrived in the midst of a boxing and wrestling matches and a vaudeville show by some of the men, also orchestra numbers. At 5:15 all faced the flag floating above and sang our national hymn. Then folowed mess call and retreat. "They had arranged a long table out under an old apple tree, where we fifteen American women together with fifteen of the luckiest (?) among the officers sat down to ’slum.' I had heard of 'slum' many times from the presented with a huge plate of it - (something like our Irish stew) meat potatoes, vegetables and gravy. We were served on a various assortment of plates, salvaged from evacuated homes. After the dinner we danced for two hours in a tent with a board and canvas floor fixed for the occasion. The men certainly enjoyed having us — said it was their only social in a year. Of course we were glad to be there, too, and enjoyed it immensely. "As the ward has again been evacuated of 26 patients. I have been put on night duty for three nights at a French hospital. Have only seven patients. Pneumonia, lung and other bronchial affections. "Miss Gilbert, one of my roommates and I are to return to Paris Thursday a. m. Of course I am rather loth [sic] to leave but feel the new experience may be worth while. Expect a return to children's service or to be transferred to the military service. Santa Rosan Tells Interesting Story of Trip and Describes Scenes Älong Route -- Has First Taste of Wine and the French Hospitality -- Language and Customs Strange, Yet All Are Enjoying Life and Good Health While Preparing for Active Work of War. ...Through all the country that we had traveled, we saw many old-fashioned contrivances and buildings, and the people, and the machinery and methods of all kinds of living and working. The people dressed very old fashioned, wore wooden shoes, lived in very peculiar shaped houses, built of stone, which were mortared up with clay or dirt. Some of the American boys could talk the lingo, but most of us had to listed to the peculiar noises and be satisfied. Good water was plentiful in most places, but most prevalent of all was the historic French wine. This village is almost directly south of Paris, and if anything, a little east. This village is about 600 years old — as quaint and old as many of the other little villages that we saw during our travels. We are about 14 miles from a fair sized town by the name of Clare - a fair sized town. The French people are indeed very intelligent and interesting in every way. They are indeed very anxious to learn English as well as to teach the American soldier boys French. I have been out to several French homes to learn French and lots of fun we had, and certainly see some very new and peculiar things. "The American army abroad is no longer petite. In nearly every city, town and hamlet are to be found American soldiers on duty. Wherever American troops are quartered there may also be found a Y. M. C. A. hut. The Y. M. C. A. is rendering an inestimable service to the boys abroad. We have found the French people very hospitable. Their charming manners, politeness, generosity and cheerfulness have won the hearts of American soldiers. These people are and have been sacrificing such as you people at home will probably never have to do. Vive, Vive la France! Dearest Mother: -Here at last is a Sunday with plenty of time to myself, so I guess you’re in for a long letter... It was two o’clock in the morning before we finally arrived, and then after that it didn't take very long to be assigned to our billets. Lieut Tooze and I are together in a room with the deputy mayor. It’s certainly a wonderful room too. Typically French - marble fire place, marble topped hand carved table, and one of those funny French beds. You know, mother, that a Frenchman has peculiar ideas of what a bed should be like. He builds it far too narrow for two people, about four feet high, and a person is supposed to lie on one feather bed and cover up with another one. I most suffocated the first night I slept in one, so I put up my own cot in the room and let Tooze have the bed. My cot is only 16 inches high, and poor Madame le Deputie couldn’t understand how in the world I could sleep on such a thing. When I came in last night I found that she had put a chair under each leg so that it would be high enough, according to her ideas of a bed. From our room we get a wonderful view of Monsieur's garden. It's just like the French gardens that we used to see in the movies - white stone wall with red tile tops on them, roses and all kinds of flowers, and beautiful climbing vines everywhere. It really doesn’t seem true. My! you should see some of those towns which have been subjected to bombardments and later been invaded by wanton troops. I can't imagine a sadder picture, except, perhaps, the ruins of the fine old cathedrals, some of which have been standing for centuries. The big observation balloons are'almost constantly over us nights and in the daytime we have often watched the maneuvers of the French planes doing all sorts of acrobatic stunts on high. Also, we have seen the Boche planes, which came over us on clear days to get pictures, being chased by the French aviators. These day air battles are exciting to watch. As a rule the machines are too high to see but we can hear their guns plainly and see the smoke from them - like small, fluffy white clouds. The men in the First Division, which arrived in France on June 26th, last year, are almost entirely easterners and southerners. So far they have done most of the fighting and we have cared for very few wounded out of the more recent divisions. I don't believe I have met a dozen Californians since coming over. It's very nice to have people proud of you, but it's really uncalled for in my case. I am only one of thousands of Americans in the service abroad, and we realize fully that those at home are all sacrificing and doing everything in their power to help Uncle Sam. Why, we who are over here are enjoying the work, day by day, and feel it a wonderful privilege to be helping in the hospitals. It is our thousands of American boys in the trenches and under shell fire daily that we should be proud of. They are the heroes of the day. He gave me a Boche ring, and when I asked ”Was he dead?" he answered: "Dead?—-Well, I had to put on a gas mask to go near him." This boy is in the marines, but has been over the top three times - at Catingy, Belleau Woods and Soissons. He assures me that next time he will get a German Iron Cross to send me. My fourth son is from Florida - a very attractive boy of nineteen, who graduated from high school last year. He has a hole through his left hand, made by a machine gun bullet, several of the bones being fractured also. We keep the wound irrigated constantly by means of a rubber Dakin tube and solution. He suffers from shell shock, and it is pitiful to see him — he is delirious half of the time — living over again those hours of the battle. I have written to his mother, who has two other sons over here in the First Division. Tonight they came at 11 and stayed until 12:30. It sounded pretty exciting - bombs were dropped somewhere within close range. We were reminded at once of old times. It is perfectly amazing to see what a big part the American Red Cross organization is playing in France. It seems there isn’t a thing done in which they don't lend a hand. I have had a good chance to see how much is done by them for the wounded and hospital patients and also I know how much the boys appreciate it all. It seems their resources are unlimited. I often think of the millions of dollars it must cost to keep up this huge business of theirs - and then simultaneously somes the thought of the campaigns, driven and parades in America — of the knitting and surgical dressing circles — and then I realize that there can be scarcely an individual of mature age who is not giving until it hurts - as they say. If there are no other benefits from the war - this I am sure of - it will have drawn individuals of nations closer together on account of necessity of sacrifice and giving common to all. It is rather nice to have my present small ward of patients, for I have more of a chance to "baby” them. All of the nurses feel the same way, and you would, too. No matter how "mangy" they are - and some of them are pretty much so - we love them. ...We left our position at the front some ten or twelve days ago and marched to this sector. Our marching was done at night, averaging about twenty-five miles each night, and as this was kept up for five nights it was very tiring. Not to let us get stale on the job, the last two days they marched us from noon till the next morning, and it was on these hikes that we did cover some ground. ...As you understand there is no one from home of California with me in this outfit and as I have charge of or rather am the top sergeant of this detachment of seventy men, I am about as popular as a Hun in Paris. I have a difficult job, hut I am making the best I can out of it. Dear H.:— I told you in a previous letter that I lost my trip to the front by being ill in bed with Spanish influenza, did I not? Yesterday I had a most interesting trip. A lieutenant, formerly of my battalion, and an officer of our old National Guard, who had been transferred among the many others to a front-line battalion, telephoned over to a friend at one division headquarters that he had been wounded and was in the hospital not many kilometers from us and wouid like to see some of us if we could get over to visit him. Many officers of our regiment have made the supreme sacrifice already. Some killed — many more wounded. You understand that my present job is the training of troops for the front line divisions and I am not at the front myself, but the largest part of our outfit has been sent to the front. Both officers and men have been in many severe actions already. Well, to return to my story, — it is wonderful how one’s heart goes out to a comrade, who has "been in" and "made good. I would rather have made this trip over to see Bill H—. than to have done anything I know of. Right here and now, dear H—, I am going to say. I shall never again judge a man by his personal habits and completely condemn him for having a few bad ones. At the same time I do not wish to sanction them. I hold my ideals about personal cleanliness as high as ever, but I will hereafter and through my life be able to love the good qualities in even those men with whom I would not wish to associate while they do some things that they sometimes do. This lieutenant was a rather unprepossessing looking fellow and could be called somewhat wild. He drank some and smoked a lot — liked to "see life” and all that, but I can love him from now on for what he did in the battle line at Verdon, in our recent drive on that sector. We — myself and another — got on a train which took us to a rather large city not far from here, and quite near to the hospital where Bill was. The train moved so slowly, as all French trains do now (any old time they feel like, and never run on, schedule) that we didn't get to the city until evening — so we decided to go out in the morning to the enormous new hospital where Bill was. We stayed all night at a hotel and in the morning, just as we were about to go for our breakfast, who should we run plump into on the street but Bill himself, looking quite pale, but feeling fine and cheerful. His wound was from a rifle bullet (German sniper). He was shot squarely through the top button of his uniform, the bullet entering the top of his right lung and ranging down and out under his right arm. It fell inside his clothes, where it came out. He has both the button and the bullet, as well as the trench map of the sector on which his battalion attacked. The map is all covered with blood. As extreme good luck would have it, he had no bones broken and no arteries severed. The wound was a clean one and healed quickly, so he is well and walking around now, though suffering some inconvenience from the wound. His story is very interesting. He described the German machine gun fire as very intense after the Americans had lost their artillery barrage. His battalion had advanced quite a bit more rapidly than those on its flanks, so that the Germans made it awfully hot from the flanks for awhile. His platoon was badly shot up at one stage and had broken loose and run. A big shell burst near him and be found himself whimpering and crying from the shock and excitement. He was in cover in a shell hole, but realized that if he stayed there his nerve was gone, so he forced himself out into the fight again. During the fight he twice traveled back forth with information. But here was the best thing he did. His platoon had advanced right up by the side of a machine gun position. There the boche was in the act of swinging his gun to open fire on the flank of his platoon. With a lucky aim from his pistol he shot the gunner straight through the neck, killing him instantly. For this he was mentioned in orders for bravery in action. This will give him a promotion. It is maintained by the colonel that bravery is only an officer’s duty — thus be does not receive the distinguished service order. "I know you will be interested to hear the news of some of the boys. Don Geary is here with our regiment, still and so is Burton Cochrane. Both have excellent records as officers. We are a training unit and every little while we send a large number of officers and men to the line. Over half of our old officers and men have gone most of them in the San Mihiel or Verdun sectors. Our officers have made wonderful records. In fact, all of the men who were in the old original regiment have made good in action. Reports have come to us repeatedly of the good state of training that both officers and men from our organization were in. "It is remarkable what escapes some men have. Lieut. Wm. Hayes Hammond. a nephew of John Hayes Hammond, and an officer formerly in my battalion in a Fresno company, went through the most thrilling engagement last week, when we took the Montfaucan vicinity. He was wounded in a place where, if the bullet had been an eighth of an inch to one side or the other, he would have been killed. As it is, he is already out of the hospital and feeling finely. "At one stage, with his platoon, he attacked a whole company of Germans, scattered them and delivered a whole platoon of American prisoners whom the Germans were making off with. When he was wounded and had gotten first aid from one of his corporals, two stretcher bearers started to carry him to the rear and a machine gun opened fire on them; the bearers dropped him and ran; he rolled from the stretcher to cover, but before he get out of range several bullets had passed completely through his gas mask, which was hanging on his chest. Isn’t this a thrilling tale? He was mentioned in orders and a promotion for it, with possibly a distinguished service cross. "Out of three officers who went up from my battalion to the line, all three have been wounded; this one whom I have told you about by a rifle bullet, another with H. E. shell fragments, and the third gassed. A sad case was that of Lieut. 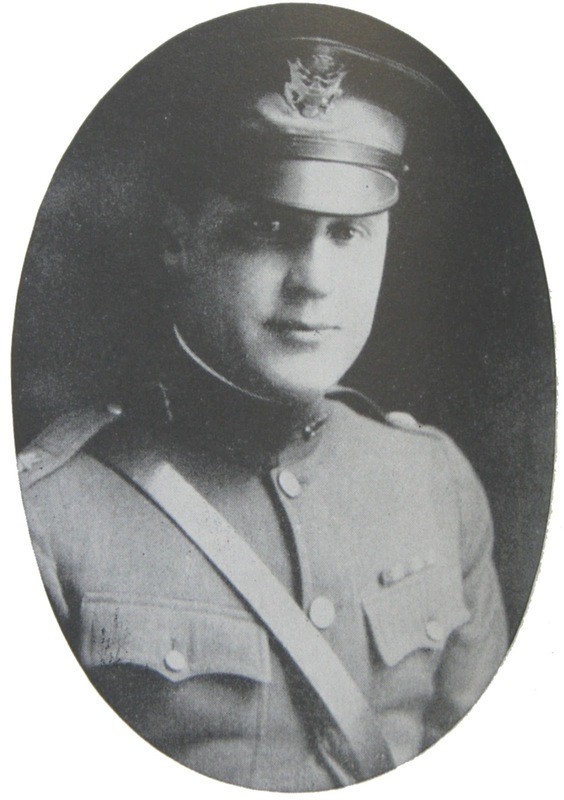 Carleton Adams of San Rafael, who has been reported killed. He was married in San Diego the day I was, a week before we left. He was a corporal in the San Rafael company at the Mexican border and won his commission last spring at the same time as Chauncey Peterson and Bill Bagley got theirs. Chauncey Peterson has been up in the line for some time, but I have not heard from him. Frank. Churchill left this morning to go up. We are now at last in a forward area and have a chance to get into the line soon, if the Boche doesn't lay down his arms too quickly. I have the word of one who can do it that he will send me into the line the first they have need for a major, so I have hopes.